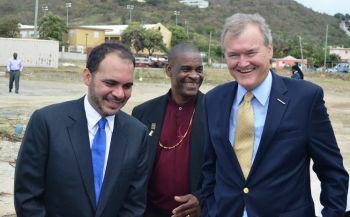 ROAD TOWN, Tortola, VI – Three of the British Virgin Islands Football Association Executives, President Andy Bickerton, Vice President, Aubrey Liburd and Asst. Secretary- Operations, Avenell Morton, will be departing the Territory on Sunday 24th May, 2015, to attend the FIFA Congress in Zurich. On May 29, delegates from across the world will convene in Zurich to elect a president to lead FIFA, the sport’s global governing body, for the next four years. Under election protocol, each of FIFA’s 209 members receives a vote and, no matter how big or small, each one is worth the same. 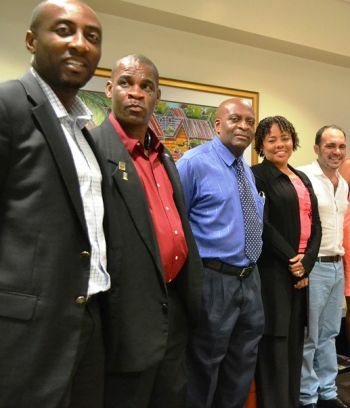 Which means the BVIFA’s vote counts the same as Germany’s, Brazils or England’s. Whilst how that vote will be used, either for incumbent Sepp Blatter or sole challenger, Prince Ali bin al Hussein, when the votes are cast next week, Blatter is almost certain to be swept back into office on a surge of political support from FIFA members across Africa, Oceania, Central and South America and large swaths of Asia, who have publicly declared their support. Africa’s support of Blatter has been echoed by federation presidents across the planet. Oceania committed its 11 votes to Blatter in January; South America followed suit with its 10 votes in March. CONCACAF, the confederation of North America, Central America and the Caribbean, expressed its support for the incumbent along with tributes in which Blatter was compared with Jesus Christ, Nelson Mandela, Winston Churchill and Martin Luther King Jr.
Not every region has been so complimentary. In Europe, home to the game’s richest and most televised professional leagues, his tenure has been regularly and loudly denounced. Michel Platini, the head of European soccer’s governing body, has led the calls for “fresh air” at the top and accused Blatter of ruining FIFA’s image. Before last summer’s World Cup in Brazil, a series of speakers at the UEFA Congress called on Blatter to make his current term his last. UEFA didn’t respond to requests for comment; FIFA declined to address his candidacy. What Blatter’s imminent re-election makes clear is that the path to the FIFA presidency no longer runs through the game’s traditional heartland. Over the past four decades, FIFA has redrawn the soccer map by enfranchising smaller federations across the developing world. Since 1975, when Blatter was named FIFA’s technical director under then-president João Havelange of Brazil, the first non-European in that role, FIFA membership has jumped from 141 nations to 209, an increase of more than 48%. In the process, it overtook the membership of the United Nations, which stands at 193. The regions that experienced the most growth during this period were CONCACAF, which has increased from 22 to 35 members, and Oceania, which has nearly tripled its membership, from four countries to 11 currently. The upshot has been a radical reconfiguration of soccer’s power structure. Before Blatter joined FIFA, the sport’s traditional base of Europe and South America accounted for 35% of total votes in FIFA’s Congress and their 49 combined votes were just 22 short of a majority. Today, their combined share of 63 votes comprises just 30% and they require an additional 42 votes to form a majority. In other words, it is now possible for a candidate to collect the requisite two-thirds of all votes necessary to be elected president on the first ballot without receiving a single vote from soccer’s hotbeds.